It was kid stuff, nothing serious, but in their teens, Tuchman and a friend were setting lines and taking bets. It turned out to be a short-lived run in the low-stakes high school underworld. Tuchman’s friend’s dad was a dentist, and one of their schoolmates was getting checked for cavities when he mentioned losing money to the dentist’s son. Pretty soon, Tuchman didn’t have a partner in this little enterprise. Brief as the stint as a bookmaker was, it was long enough for Tuchman to grasp the realities of sports betting. Tuchman started a new job in the sports betting world in conjunction with this current NFL season, the latest in his exceedingly lengthy roll call of paychecks in the gambling space. 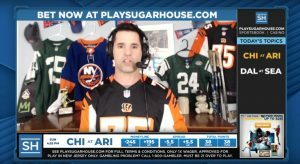 He’s the host of a video series called “Tuck’s Take,” in partnership with Play Sugarhouse’s online casino and new sports betting vertical, giving out his favorite NFL picks every week. For those who only know Tuchman from his poker work, where he’s become best known as the play-by-play voice of the World Series of Poker live stream, it might be surprising to see him playing the role of sports betting expert as well. But the reality is that sports has been a lifelong passion for the New Yorker, and gravitating toward as many fun, creative gigs as possible without tying himself to a single 9-to-5 job has proven the perfect way — maybe the only way — for Tuchman to channel his energy. When Tuchman headed off to college, first at Hamilton College, then at SUNY Albany, he had no idea what he wanted to be or major in (he ultimately ended up studying journalism and biology); all he was sure of was that he didn’t want to be an accountant like his dad. While in college, Tuchman had aspirations of playing pro hockey — not in the NHL, but perhaps in the minor leagues. Tuchman was a capable hockey player; he was no Happy Gilmore, overloaded with delusions. But he was no Doug Gilmour either. Tuchman wasn’t quite good enough to go pro. So he did what any level-headed kid would do when the professional athlete dream got iced: He moved to L.A. to try to be an actor. Tuchman didn’t become the next Leonardo DiCaprio, but he did have something in common with Leo’s buddy Tobey Maguire: a passion and talent for poker. And he was in the right place for it, in the thriving L.A. scene as the poker boom was building. At the very start of 2005, the Bicycle Casino, where Tuchman was a regular, was kicking off its Live at the Bike broadcast series and asked Bart Hanson and Tuchman if they would provide commentary on the marathon shows. “Bart was gung-ho because he really wanted to be a broadcaster,” Tuchman explains. “That was his passion. For me, it was like, ‘eh, this might cut into my win-rate.’” But Tuchman decided to give it a shot, and a new career was born. Tuchman picked the right time to dabble in poker media work, and by the time the biggest World Series of Poker Main Event ever rolled around in 2006 — the last one before the Unlawful Internet Gambling Enforcement Act tugged on the rug underneath the online poker industry — opportunities were flowing David’s way. “It was a case of, work begets work,” Tuchman says. Live at the Bike was developing what he describes as a “cult following” and Tuchman and Hanson started going into the studio to do an edited version for European audiences. The Poker Channel asked Tuchman to host a news show covering the WSOP. He called Full Tilt’s Million Dollar Cash Game, and fresh off a divorce, he moved to London in 2007 and started covering the NFL and NASCAR for Sky Sports, while also adding more poker work for PokerStars and the European Poker Tour. Then came the big break, an opening with the most recognizable brand in poker, WSOP. A dinner with renowned poker TV producers Mori Eskandani and Eric Drache, both of whom would go on to become members of the Poker Hall of Fame, kicked off a connection that led to Tuchman being hired as a producer at the first WSOP Europe. The next year, he was in the booth for the live stream of WSOP-E, and in 2011, he started his defining media gig, calling the stream of a month-and-a-half of World Series of Poker action in Vegas every summer. You might think sitting in a booth talking about poker for somewhere in the neighborhood of 12 hours a day for weeks on end would sap a man of his enthusiasm for the game and of his supply of discussion topics. Not so for Tuchman. As Norman Chad noted on the 2012 ESPN Main Event broadcast, Tuchman believes he has commentated on more hands of poker than anyone in history. Volume has never been a problem for this guy. In fact, the greatest challenge of WSOP streaming for Tuchman has nothing to do with the work itself. The challenge lies in what he has to leave behind every June and July. Tuchman’s two sons, ages 5 and 1, have birthdays one day apart, and of course, those birthdays fall in June, smack dab in the middle of the WSOP. Fortunately for Tuchman, he has understanding bosses. 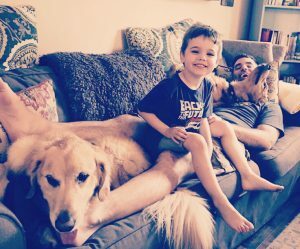 He gets those two days off every year to go home, and since he lives in Pasadena, a short flight from Vegas, he’ll make a handful of other 24-hour trips home to see his wife, Molly, and his kids, whenever there’s a stream-less day on the schedule. A decade or so ago, when in London working for Sky, Tuchman thought maybe he was transitioning away from poker and into mainstream sports coverage. He did start hosting the Pro Football Focus Podcast, but otherwise, he was wrong; poker remained central to his career. Still, he kept up an interest in sports betting, and got in on daily fantasy when the games were relatively soft. A few months ago, with sports betting going legal on a state-by-state basis outside Nevada after the Supreme Court’s May 14 ruling overturning PASPA, a mutual friend connected Tuchman with the CEO of Sugarhouse. Tuchman’s Biff Tannen-like hot streak cooled off, as they all do, and he’s hovered around the .500 mark most weeks since. But he remains determined to exceed expectations and puts a lot of pressure on himself to succeed. “It’s weird, I remember when I was covering the NFL at Sky, I cared less about my own fantasy teams and more about the picks that I had made public, because I wanted to do well for everybody and I don’t want to disappoint people,” Tuchman says. “I was watching the games [last week] and I was absolutely focused on the games that I had picked. I wanted to do well for people. I’m a competitive guy, I played college sports. Tuchman just keeps having fun and collecting gigs. 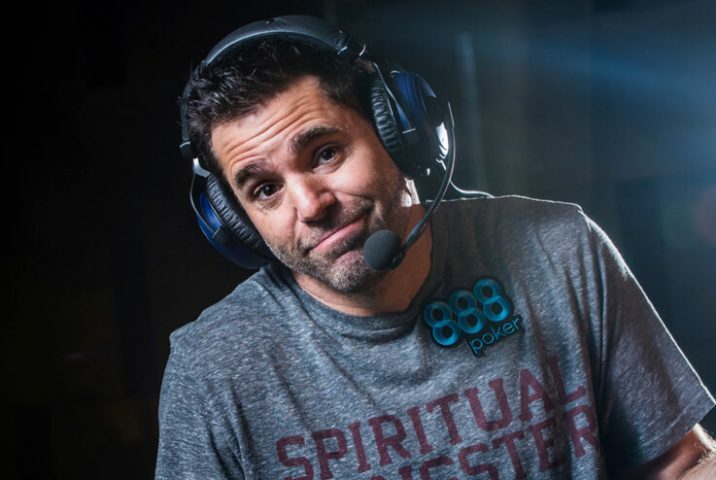 For the last 18 months, he’s been doing commentary for 888poker’s live streams. He’s an instructor on the training site CrushLivePoker.com. In years past he’s tried working in physical therapy, in investment banking, he’s bartended, he’s waited tables, he’s done enough acting to get SAG insurance, he’s coached kids and adults — from ages 5 to 65 — in ice hockey, and he’s stepped on stage in a children’s educational theater company. There’s nothing that the host of “Tuck’s Take” won’t take on. He’ll dip his toe in almost anything. But it’s specifically the gambling industry where he’s found the full foothold. He learned early on how difficult it is to be a winning gambler. But providing commentary on the world of gambling? There’s only upside there.